This is an election year, and, throughout history during election years, color seems to disappear. No happy colors are trending in the market. So what do you do if you want to add color to your home? Start by speaking with a trained consultant at Windows & More here in the Lake Ozark, MO area. We can help you with some refreshing ideas. You can use paint, throw pillows, area rugs, and accessories as relatively inexpensive spots of color. In fact, you may decide to change or rotate these items seasonally to give your home fresh looks throughout the year. In the end, color used correctly will brighten your mood, provide a tranquil retreat, or put a smile on your face, so don’t be afraid to add a punch of color—even if it’s an election year! Color or Neutral for Window Treatments? Afraid to put color on the walls or windows? The ceiling is also a very interesting way to give your space a punch of color. Remember that the black undertone colors of blues, greens, lime greens, teals, and purples recede space. If the ceiling is only 8 feet, these colors will not come down into the room. 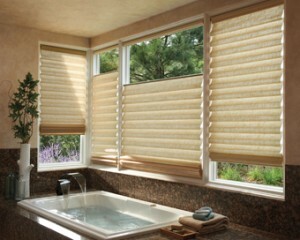 The ceiling will look taller, and your window treatments will recede into the space and not be noticed as much. 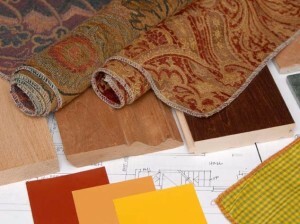 The brown undertone colors of yellow, gold, orange, red-orange, red, and magenta will bring the ceiling height down and make the room feel cozier. They advance space!